By Hongkiat Lim in Desktop. Updated on November 10, 2017 . WIth more than 5 million pixels packed into a 15.4-inch display, Apple’s latest crowning achievement in its notebook line, the MacBook Pro with retina display has raised the bar for its competitors, making everything on the screen more vibrant and sharper than ever. Everything looks better on 2880 x 1800 pixels but here’s where we face a problem, third-party apps now look worse on the new MacBook Pro than they did when viewed on the previous Macbooks. That means that non-native apps that we use on a regular basis like Chrome, Firefox, Photoshop, MS Office etc that have yet to update their apps display now suffer from blurry text and low-quality graphics. Designers will see that images aren’t sharp at 100% and for web surfers using Chrome or Firefox, they’d see pixelated fonts and less-than optimum images. The entire browsing experience is now a major turn-off. To get an idea the extent of the change, check out the image shown below. Fonts are properly rendered and looking crisp-sharp as ever on Safari. Compare that to a view on Chrome or Firefox and you’ll have no such luck. Can you stand reading blurry text all day long? Is there a solution to this problem? Yes and No (or not yet). It’s now up to developers to update their apps to take advantage of the much-sharper retina display. In fact, we’ve stumbled upon some temporary fixes that can help improve your experience with the new MacBook Pro with retina display. Firefox is reported to be working on temporary fixes to cater to MacBook Pro users. You’d proably need to update to their latest browser for the changes to take effect. Hopefully the fixes won’t take too long. 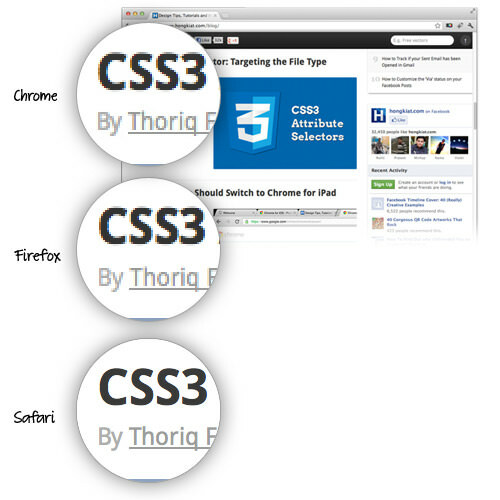 As for Google Chrome, development to make their browser ‘shine’ on retina display is already under way. Those who can’t wait will have to make do with Chrome Canary for the time being. 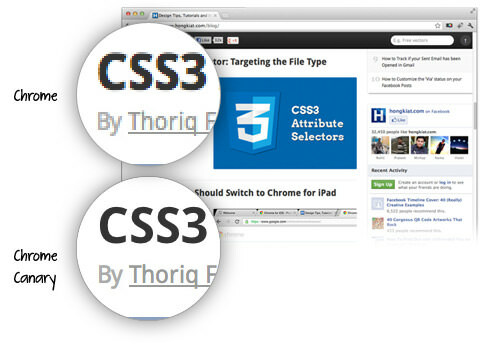 Here’s a comparison of the display between the current version of Chrome and Chrome Canary. However, if you choose to download Chrome Canary, bear in mind that it’s still in beta and complete breakdowns are to be expected, but trust in Google to make non-believers convert. One last bit about Chrome Canary is that it runs alongside stable Chrome. 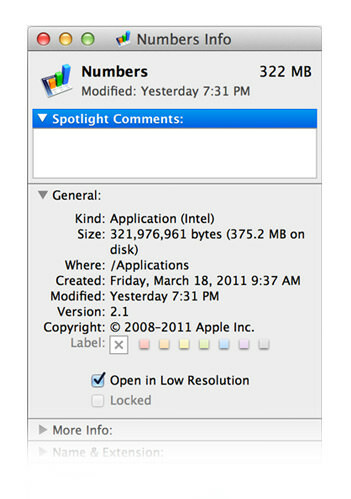 Deselect "Open in low resolution"
It will take a while before all your favourite apps to get up to speed with retina-compliant enhancements. If this is an issue with your work or if you can’t function anywhere below optimum conditions, then you’d probably want to hang on to your old machine in the meantime.